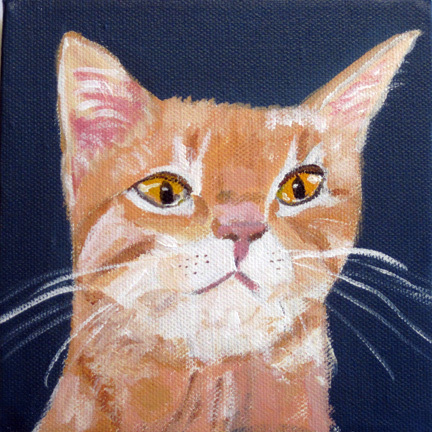 February Announcement: First of all, the 30 Paintings in 30 Days Challenge will be over, but Lou has had such a fun time doing it she will continue painting cats. She will return to blogging about writing here, but on the side, she will continue to paint cats on a commission basis. There will be one difference. She will be painting them at a little slower pace (one a day is a challenge for sure) and she will be painting only pictures of cats for owners who want to buy a painting of their cat. The good news is that she is going to continue to sell the 6″ x 6″ x 1.5″ paintings for $40.00 plus postage. (If you want another size, just contact her and she’ll give you an estimate). Anyway…. you can contact her with any questions about this by email at maxthequiltcat AT gmail DOT com. This entry was posted in art, painting and tagged cat art, Guido. Bookmark the permalink.